5a: Low kick. hits low. 5b: Rider kicks the opponent in the chest. Hits mid. 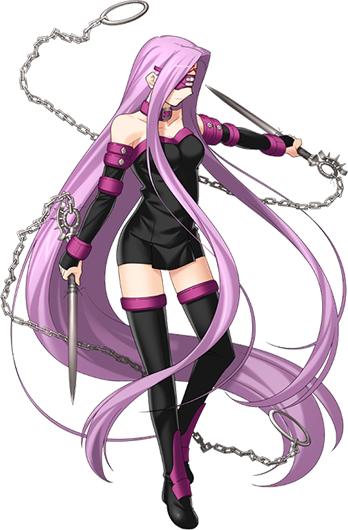 5c: Rider steps forward and spins, stabbing the opponent with her nail. 2a: Rider lays low and kicks. Hits low. 2b: Rider lays low and kicks. Moves her forward. Hits low. 6b: Rider takes a step forward and delivers an axe kick. 236a/b/c: Rider shoots a chained nail. Usable in the air. b: Pull towards and kick. c version = Costs meter. Launcher. 22a/b: Rider gets into a stance. 236236a: Bellerophon super - 1700 dmg. 236236b: Remove blinders, required to activate Breaker Gorgon. ABC: With blinders removed, activate Breaker Gorgon. All opponent actions are 25% slower, including falling. 236236c: Rider uses her noble phantasm.